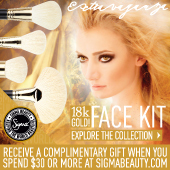 The Sigma Beauty Extravaganza Collection is a lavish assortment of one of a kind, brushes with 18K gold plated ferrules. The Extravaganza Face Kit features four unique brushes specially designed to deliver a luxurious makeup application and come in a deluxe carrying case, perfect for traveling and storage. Fan - F90 Sculpt and highlight cheeks and face. The unique shape is perfect for application of powder products onto cheeks and for polishing foundation for a flawless finish. Natural bristles. Blush - F92 Perfect for application of powder blush. Also ideal for shading and highlighting cheeks and face. Natural bristles. Kabuki - F94 Dense and rounded, this brush effortlessly blends, bluffs and polishes product on the face and neck. Natural bristles. Powder - F95 Dense and tapered, this brush is perfect for applying powder products to the face, neck and décolletage. Natural bristles. Will you be picking these up? Loving them or leaving them? Let me know in the comments below, I love to hear from all of you!